Price: from € 65.50 p. p.
Follow your Licensed English speaking and knowledgeable tour guide and become an expert on the wonders of St. Peter’s Basilica, the Sistine Chapel, and the Vatican Museums. 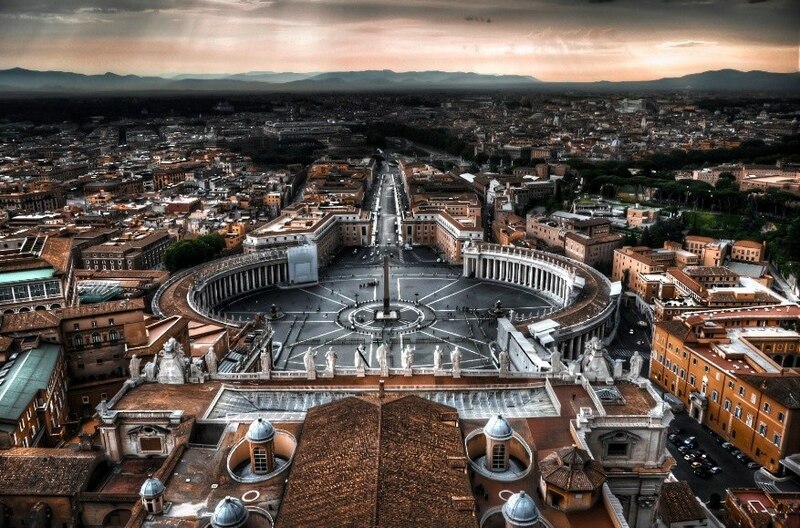 Vatican: Visitors to Rome always take with them profound memories of art and history once visiting the Vatican. This art collection includes works by Raphael, Michelangelo and Caravaggi along with other Roman and Greek Masterpieces. Attracting thousands of visitors each year, after renovation, are the glorious Sistine Chapel and St Peter’s Basilica.Vatican Museums - The various galleries house the most important ancient art collection in the world. 7 Km to walk across, 1,400 rooms with 65,000 works of art. Containing such items as Tapestries with Flemish and Italian examples ,candelabras with fresco paintings and statues; and the historical maps painted by Danti in the XV c. Bernini’s Royal Staircase leads to Saint Peter‘s Basilica, rebuilt in the XVI and XVII c. The Basilica’s interior is decorated with thousands of gilt tesserae, prized marble, Byzantine and Baroque mosaics, and holds the renowned Pieta by Michelangelo as well as Saint Peter’s Tomb.The Sistine Chapel painted by Botticelli, Signorelli, Rosselli, Ghirlandaio, Pinturicchio and Perugino and the famous ceiling painted by Michelangelo along with other examples of his work. Find answers to questions you have about the Catholic Church. Learn with us the meaning behind the art, both historical and present day. Our expert and knowledgeable guides make this pleasurable as well as time saving and efficient during your private tour. NO SHORTS, NO SLEEVELESS OUTFITS PERMITTED. We would advise against carrying back-packs, umbrellas, and other bulky items. Highlights: Visit of the Vatican Museums, Sistine Chapel and St. Peter’s Cathedral. Available: Every day, Except Sunday and public holydays. Price per tour: 1-2 pax € 365,00; 3-4 pax € 435,00; 5-6 pax € 510,00; 7-8 pax € 580,00; 9-10 pax € 655,00.